WHEN RVS COLLIDE ....CALL US! Make sure the job is done right the first time with PGA Collision. 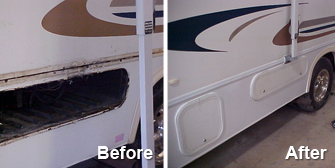 As specialists in RV repair, all of us at PGA believe in making your RV look like it just rolled off the showroom floor. We have a 52' downdraft spraybooth, which means that your RV will have the best paint quality when the job is complete. We're equipped to handle any class and any size RV you might have. We have all the necessary equipment to properly repair RVs, coach trailers, pop-ups, toy haulers and anything else you can camp or travel in. We do complete caulk checks with all estimates. Don’t take on the insurance company by yourself. We send an estimate, as well as any necessary photographs, to your insurance company. When we have the claim number, we handle the rest of the paperwork.